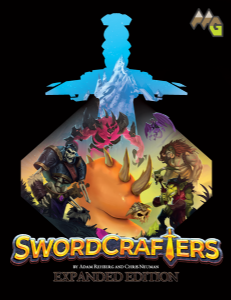 Swordcrafters Expanded Edition includes the Swordcrafters base game and expands on the game with three exciting new modules that can be played singly or combined. The sword of protection has broken again. The king has opened up the forgotten tomb granting you access to Sword Mastery, Sword Relics, and Sword Tips. 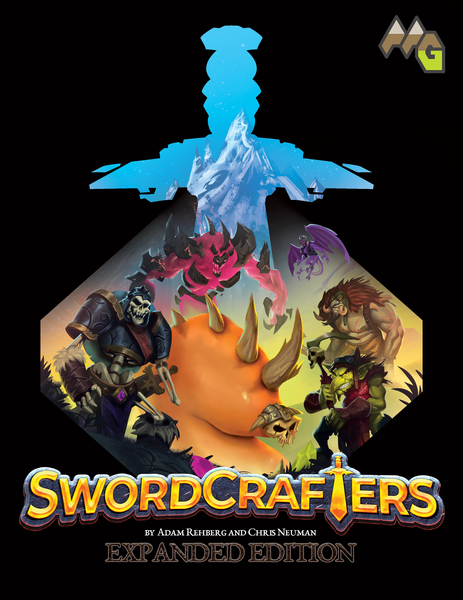 In Swordcrafters, players compete to forge the best sword scoring based on length, quality, and magic. Each round, each player makes one cut in a grid of sword tiles to create a separation. After the separations phase, each player selects one grouping of sword tiles and assembles them into their sword. When there are not enough sword tiles to form a new grid, scoring occurs. Players hold their swords in the center of the table to score based on length. Sword quality is based on the highest number of adjacent matching gems on each side of the sword. Sword magic scoring is based on the relevant gems required by each of three sword magic cards. The Expanded Edition layers in three exciting new modules: Relics, Tips, and Mastery. Relics add new tiles to the grid creating more importance on your set collection expertise. Tips grant players two additional goals that score based on their sword. Mastery challenges players to complete mini-goals throughout the game.